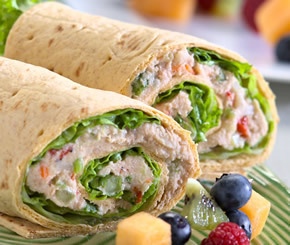 This tuna salad wrap recipe can be used for a sandwich on bread or a salad. Total flexibility! All these restaurant recipes are the right recipes since I know they actually work. There are some fabulous restaurant recipes for you on the website. For over 30 years restaurant customers have “tested” ("tasted" :) ) these recipes and approved! And they have asked for these restaurant recipes many, many times. So ...here they are ...for everyone to enjoy. Preparation time: 20 minutes. Serves 4. In a large bowl, combine first five ingredients for your seafood mixture. Generously spread tortilla with Dijon mayonnaise. 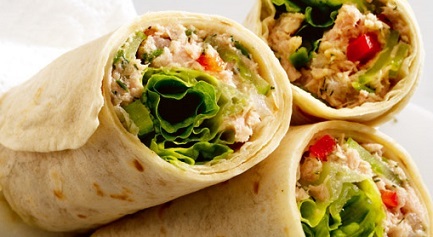 Spread tortilla with Dijon mayonnaise. Thank you for visiting. 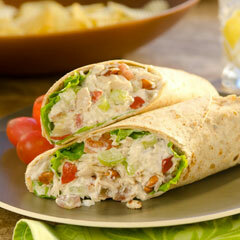 ENJOY this restaurant Salad Sandwich recipe and the others on the website. Check out the other cooking resources available on the website by clicking the link below. Please remember to Bookmark Real Restaurant Recipes. I am adding more recipes and information on a very regular basis. Thank you very much. You can cook with confidence and style! "A mystery: Why do people say they are having a tuna-fish sandwich? No one ever says they're having a chicken-bird sandwich."